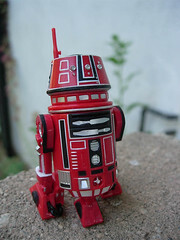 Commentary: A truly striking design, R5-K6 repaints the 2006 R5-D4 figure in a very red and black color scheme. Hasbro teased us with a cardboard facade of the droid in an exclusive X-Wing fighter a few years ago, so it's really great to finally have the figure along with an improved version of his owner, Red Leader Garven Dreis. As you can see, the figure boasts a vibrant color scheme with black and silver bringing him to life. The design is unlike anything else in the figure line, so if you're a fan for high-quality repaints and/or astromech droids this one is a must-buy figure. 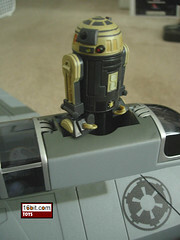 The droid sports a retractable third leg, and if you twist the dome the "bad motivator" pops up just like on R5-D4. 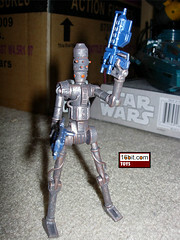 Since this is the only release of this droid, it's worth tracking down. Hasbro did a great job here, and with any luck it might se a reissue in the chance that you missed it. Collector's Notes: This set has come and gone, and collectors have taken notice. Get one ASAP if you want one, or wait for interest to drop eventually as figures tend to do. Commentary: It wouldn't shock anyone if the ARF Trooper were just another Clone Trooper with a new head, but Hasbro actually redesigned the hips too. The figure has ball-jointed legs, which is unusual in the animated line. 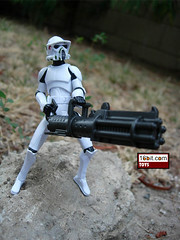 This allows the figure to assume more action poses, which is good for being posed with his giant and heavy gun. It's also good for piloting an AT-RT or other vehicles, and it wouldn't surprise me at all to see this body reused to make (or remake) other clones as we go. It has 14 points of articulation, but the added motion in the hips and wrists makes this one of the best figures in Hasbro's entire line to date. 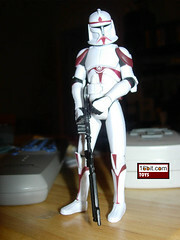 The figure is clean and white, with some special markings on the helmet. Clone fans should make sure to get one (or more) of these for their armies, it's really a nicely made product. Collector's Notes: The figure has been doing very well so far-- it's assumed it will ship for a while, but who knows? It's been a slow Q4. A similar (if not identical) version will be packed with the AT-RT vehicle any day now. 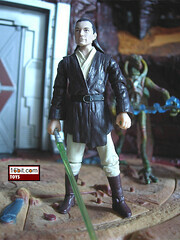 Commentary: Without the playset, this Qui-Gon Jinn isn't particularly exciting. It has loose limbs so you can plug him into his playset, which has a big lightsaber-shaped joystick that allows you to control the figure and have him "fight" things around the hangar. It's a really ornate way to make a deluxe figure with an action feature, using a playset as a disguise for a fairly clever way to bring a single figure to life. Because of this, the figure has very limited articulation. 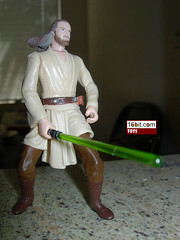 Also, the sculpt is a little less crisp than other figures, and the deco isn't as good as other Qui-Gon Jinn toys. It's a perfectly fine figure, but this is one you get to finish a collection rather than to be your one-and-only Liam Neeson Jedi. The figure is basically OK, but the playset itself is the reason to pick up this figure. It's a nice way to display some of your toys. Collector's Notes: The figure didn't become a hot commodity, mostly because the entire era was kind of a turkey that way. The packaged playset with both figures can be easily had for less than original retail on eBay. In some cases, for less than the price of an individual figure. Commentary: Reusing tooling is a big part of Hasbro's master plan, and Juno Eclipse was originally created as a 2007 basic figure who, when the game The Force Unleashed got delayed, also got pushed back until February 2008. The game itself saw release in September 2008, meaning that this figure was clearanced out before the game hit stores... and a repaint of this figure hit before the original. How about that? Juno is based on one of the outfits in the game, but not the one you see the most. It's a fairly standard Imperial uniform, complete with fully removable hat. She is super-articulated with 14 points of movement, but sadly the lower part of her top blocks the movement of her legs slightly. The sculpt is great, although her hair is a little pale-- or maybe it's her skin. Either way, she's just a little pale. It's a great design, and there are so few Imperial figures that it's great that Hasbro made this one. She's a perfectly fine Expanded Universe figure, although her other outfit in the game was slightly cooler and would probably have made for a better figure. Oh well! At least we got this one. 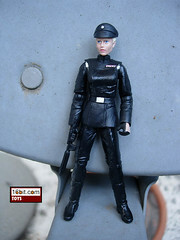 Collector's Notes: A "pre-paint" of this figure was sold as Deena Shan in late 2007. 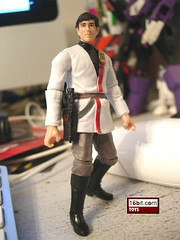 The figure was basically identical except for the grey uniform, and the hair was retooled on later shipments. Juno Eclipse was a rotten seller, some stores had tons of her left over after the line had transitioned to The Legacy Collection. She was a common sight on clearance racks for as little as $1.50. A new version of the figure with a retooled torso and open jacket is coming in 2010 as a Toys "R" Us exclusive, so if you just want a Juno, you may wish to wait for that one. Commentary: For years, Hasbro has been asked by fans to make R2-D2 with a brushed silver dome to match the entirety of the line. You see, all the astromech droids have these greyish silver domes, but for some reason almost every R2-D2 had heavy flame or damaage markings and/or a shiny metallic vac-metal dome. As such, he stood out against R2-A6 and his many companions, so it's awesome to not only see Hasbro do the Vintage Original Trilogy Collection (2004) mold in a better shade of silver, but to also block up that annoying light-up eyeport. Truly, this is the best R2-D2 has ever looked based on this mold. Truly, this figure is something of a Christmas Miracle, but it came out in October so it was more of a Columbus Day Miracle. 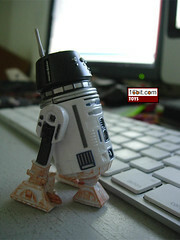 The figure is, basically, the perfect modern R2-D2 in terms of deco and looks. Are there quibbles? Yes. But it's basically the best-ever individually packaged R2-D2 figure created based on the movies, so far. (The cartoon one from 2008 is arguably the best ever, period.) Since it's the same basic VOTC mold, let's point out the changes. First, the "panel" on the body is glued down, and has been resculpted with a Jawa restraining bolt as seen after R2-D2 is captured. The dome is a brushed silver rather than vac metal. The body has a little bit of dirt on it, but it basically clean. The circle at the top of the dome is black, not blue like it should be. This is because the mold for this piece is also the same as the central eye, which is now opaque black rather than translucent blue. The light-up eye port gimmick lost its charm about 10 years ago, so it's nice to see it going away for this fairly top-notch release. Oh, and the lightning accessory is an awkward fit. Not totally disposable, but not as good as the R3-T7 one in terms of fitting well. This and the new Battle Pack R2-D2 are both good for different reasons, but this one I think is just a little bit neater-- the bolt and the fact that it was individually packaged helped it out a little. Get it if you can! Collector's Notes: This figure is newish and shipping in a few cases, but its popularity may render it desirable down the road. However, it's more likely we'll see more figures like this, or ones that are close enough. The recently released Resurgence of the Jedi Battle Pack has an R2-D2 with similar deco but based on the R4-G9 mold, for example. The Resurgence R2-D2 and this R2-D2 are virtually identical in deco, except this one has the top of his dome as black, he has more dirt, and a square on the back of his dome is unpainted/silver instead of blue. Either is great, but the restraining bolt makes this release just a little bit better looking. Get either one, you'll be glad you did. Commentary: This is one of my favorite figures of the year. No joke. Gha Nachkt is a completely new sculpt, and is essentially a shorter, dumpier, fatter, greasier Bossk. How can you not love that? Voiced in the series by the fantastic Ron Perlman, Gha's figure is packed with personality. 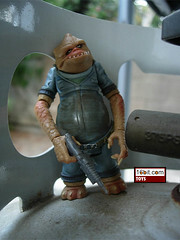 He's got a bad eye, a droopy face, really nasty overalls, and a lot of articulation-- even ankle joints. Due to the fact he has legs similar to those of Cotton Hill (i.e., no shins), his legs are pretty stumpy and this gives him a unique perspective given his huge arms and his species' penchant for being, well, huge. The scaley skin is really well-represented, he has no problems standing (but sitting isn't really an easy thing for him to do due to how his hips were designed), and he's a bit of a sad sack. There are so few figures from Hasbro that are fat, or too short, or in some way kinda disgusting that this one is a real joy. The perfectly-sculpted heroes and villains of The Clone Wars have fantastic builds and perfect bodies, so Gha Nachkt is a real breath of fresh air in the same way as Whorm Loathsom's different body type. These cartoony figures really set the line apart from most of the figures in the past decade and a half, and this figure is, to me, the single best argument to collect Hasbro's newish cartoon line. If you buy cartoon figures, you owe it to yourself to get this one. Collector's Notes: This figure is presently exclusive to this gift set, and was the only new sculpt in it. The IG Droid in the pack is slick, because the paint looks more cartoony than the carded release. We'll look at him later. Overall, I really like this set for what it is-- which is to say, mostly rehash with one really cool new figure. Commentary: This Clone Trooper uses the same mold as pretty much every one since 2008, although this particular one is historically significant in that it's the first with the "new helmet." This redesigned helmet sculpt has a bit if a hole where his "chin" is, plus a slightly broader forehead. At first it looked really weird, but the truth is that it's truer to the animation designs. The figure itself sports the orange markings of Obi-Wan Kenobi's squad, so it's pretty swell-- add it to your army, get a bunch, etc. He has the same articulation as you're used to, so check out the other FOTDs for the specifics. Collector's Notes: This figure came and went pretty quickly, but it's assumed we will see it again due to the sheet number of them on the series. If not this one specifically, other members of the battalion should see release eventually. 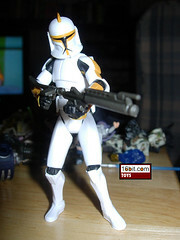 Similar troopers were sold as deluxe figures with jet packs, and another 212th Clone with the original helmet sculpt was shipped in a Target-exclusive Battle Pack in November of 2008. So you can probably make a pretty good 212th Squad at this point. Commentary: In 1999, it seemed obvious that Hasbro was going to need to find a way to do a ton of unique Darth Maul toys. He was the most popular character in the movie, despite having few lines and little to do other than fight or snarl, but we all dug him. This particular figure is molded to look like he did in a scene before he sends off some probe droids. Since all he really did was stand around menacingly, it isn't too surprising that this newly sculpted figure doesn't have a ton of articulation. He has a moving neck, plus joints at the shoulders, hips, elbows (swivel), and waist. His arms are the only really meaningful joints, allowing the figure to hold his binoculars and look through them. That's about all the action this figure is going to give you, which shouldn't be surprising as he ships in something called a Trophy Assortment, of which he was the only memeber. The sculpt is excellent, but the paint could have been better. The robes have a lot of detail, and Hasbro even sculpted the super-long double-lightsaber hilt to his hip, which you can see on the robes under his outer robes, so you almost can't see them. There's a lot of detail under the larger outer cloak, were Hasbro so inclined they could sell the figure with a different head and minus that cloak and it'd be just fine. The head has a hood sculpted on it, and its paint is a little weak-- the red is too dark, and the detail is pretty middling. The figure itself is almost 100% black, without any gloss on the boots or anything special on the gloves. There is a silver droid caller sculpted to his wrist, and the lightsaber hilt was also decorated. This isn't a figure to play with so much as it is one to admire on a shelf. It looks really cool with the tiny repainted MicroMachines Sith Infiltrator standing next to him, and I wish this continued. A tiny vehicle with a figure was a great idea, and if Hasbro made more of the stands, which can hold any Star Wars MicroMachines vehicle, I'd have bought a bunch to set up figures with their pilots. It was a really clever and creative idea that just came at the worst possible time at a pretty awful price. When this hit for $12.99, a basic figure cost $6.99, and included a stand and accessory. In short, Kay-Bee charged fans an extra $6 for the MicroMachines vehicle, which was about a $2 value at the time. Collector's Notes: This figure was a weak seller in its day and was supposed to be the first in a series of "trophy figures," which was actually a really swell idea. This one didn't move, and as such the subsequent figures-- Obi-Wan Kenobi and OOM-9, each new sculpts with repainted MicroMachines vehicles-- never hit stores. Interestingly, the figures were tooled and were never actually produced. None seem to be on eBay at the time of this writing, but online stores that have them are charging $10-$15 for them. Factor in 10 years of inflation, and that's a price drop. Commentary: As a figure that took a while to make, it's surprising that we got two versions of 5D6-RA7 at all, and it's a pretty awesome figure. It's not quite super articulated because of the bizarre elbow joints which result in some pretty funky movement. It's more droid-like, of course, but it may come off as stiff or scarecrow-ish. When fully assembled, he is jointed at the neck, waist, shoulders, elbows, hips, and knees. In other words, he's basically decent. The only real ball joint is the torso, and the limited movement of the elbows basically qualifies. The sculpt is excellent, and it's nice to have a figure like this that isn't made with the shiny wrap of vac-metal paint. The detail on the helmet is pretty good, although I did expect more detail in the mouth grill. The black paint deco looks a little weathered, but not too much, giving the figure a quasi-metal finish. If you have the means, it's absolutely worth getting. 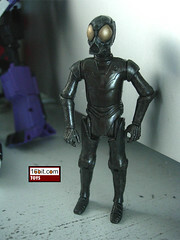 Collector's Notes: This figure is a remake of 1998's "Death Star Droid." Same dude, new mold. It came with Wave 3 of the Legacy line, which was a series of repacks and repaints. Oh, and it's "5D6-RA-7" everywhere except for the packaging for the figure. The mold was also used to make MB-RA7 in silver. Commentary: This barely qualifies as a figure. It's the right scale, but Qui-Gon Jinn has no articulation. I don't mean "it doesn't move much," I mean the whole thing is one damn solid piece. 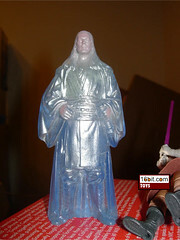 This clear blue figure has some painted details on his face, specifically a fleshy color, to better simulate the look of the holographs in the prequels. It's a little off, but it's slightly more accurate than the clear blue and purple figures we've been getting steadily since about 2005. As figures go, this thing is a statue. You can look at it, and that's about all. It's pretty cool to have it with the light-up communicator base as an action feature, but again, it doesn't do much. The base itself is pretty neat as a sort of prop replica, but the ability to spin the figure when you want isn't much of a fun play feature. It was a neat idea, but it's no wonder that this line was abandoned after the first two figures It's a neat curiosity, but hardly worth shelling out a lot for. Collector's Notes: I picked my first one up at ten bucks. I also picked up more on clearance at $0.50 each. These weren't popular items, and have never been rereleased. Get them cheap if you get them at all. As in, not worth the ten bucks. The figure has great articulation, and while the plastic skirt under the cloth cape does hinder movement somewhat, it's more of a display figure than a Starfighter pilot figure. The various bits of armor mostly stay on just fine, although the "sleeve" piece does fit awkwardly. Vader has no problem hanging on to his lightsaber, and he plus into his stand perfectly. This is one of my favorite figures just because it's such a good take on the character, but again, I do dislike it when he's presented as less than an indestructible monster. Ah well. Still, a great figure, well worth owning in your toy stash. Besides, it's not like there are many unique different Darth Vaders you can do, so this one is a nice, new, and different release... even if it is basically the same kind of thing as the Evolutions figure. Collector's Notes: This was first released on a 30th Anniversary Collection package in 2008, and later reissued on a blue Legacy Collection package. The 30th Anniversary one has a display stand. Commentary: Hasbro has redone so many figures that in some cases, you can army build just by buying one of each unique release. 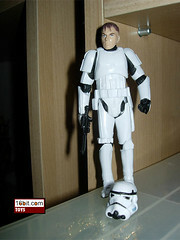 The Clone Trooper (327th Star Corps) is one of these. Seriously. There's the 2005 Evolutions figure, the 2007 Target Battle Pack with 3 more versions, this one, and the 2009 Gelagrub rider figure, just for starters. That's almost a squad right there. The figure has 14 points of articulation, clean armor, a swivel (but not pivoting) waist, and a helmet that still doesn't quite fit. That's the big bummer about this mold, when he has the pauldron over his shoulders, his chin may stick out a little. Still, it's a decent figure, worth owning, and available in enough slightly different versions that you may as well pick 'em up at some point and build yourself a little squad of traitors. Collector's Notes: This is the individually carded Legacy figure. Which is a repaint of the 2005 Evoutions figure. 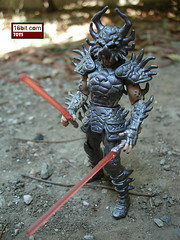 The 2008 carded Legacy figure is very, very similar if not identical to the 2007 Target-exclusive Battle Pack version. The carded version has two variants, one pauldron is brownish and the other better matches the stripes of the armor. Action Feature: Twist dome to raise "bad motivator"
Commentary: While some may disagree, I think this Battle Pack is one of Hasbro's better offerings, not just because of R5-M2 but the whole set is actually pretty solid. We're here to talk about this droid, though, which is a background design that-- let's face it-- nobody really knew or cared about until pretty much everything else started getting made. Hey, in this new era of toys, repaints are an inevitability and a lot of us dig the astromech redeco thing, so he's a welcome repaint of R5-D4, himself a retooled R2-D2. The figure has mostly blackish or dark blue panels, with some white for the body and a little grey mixed in for good measure. The figure still has the pop-up motivator, and a little red rusty dirt on the bottom for some reason. I never quite figured out why a snow planet droid would have quite this color of dirt, unless he just got off the boat from Geonosis or the Outback or whatever. 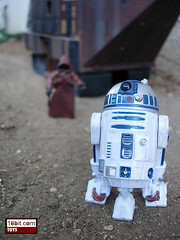 If you need more droids in your dioramas-- and you probably do-- this is a fine set to grab. This is the only figure in the Battle Pack previously unproduced, so it's kind of a bummer in that sense, but the other figures are pretty good and the Probot repaint is really slick. So yeah, I'd say get the set for R5 and keep it for the other figures. non-attack, regular modern R5-D4 was done in 2006, so this is basically one of many new droids based on the design. So if you want a figure that looks good but can't stand up straight, this is it. The Rebel logo on his holster is pretty sweet, so I have a hard time not ultimately liking this one despite its flaws. There's enough good parts to make it worth your while. Collector's Notes: First released in early 2009, it was pretty tough to get. The set was repackaged in late 2009, and was also pretty tough to get. As an extra in the background of a major battle scene, he doesn't draw a lot of attention to himself or have any lines, plus he reuses the body of a Luke Skywalker figure from the novels. So arguably, he's not entirely authentic to the film, but pretty close-ish. (I believe I heard the actor was taller, too.) When it comes to some of these minor characters, apparently, we're going to have concessions. Which is a shame, as some of the other prequel Jedi bodies probably would have been slightly closer to the right build and outfit, but oh well- this is what we got. The head sculpt is good, and the 14 points of articulation are certainly decent. The blue lightsaber is nice enough. As this will likely be the only version of this character you ever see as a toy unless he shows up in a big way on TV, well, why not get it while the getting is good? Collector's Notes: Either Target's roll-out of these is staggered, or they're going to be short. It's too early to tell, but I've not seen many of these yet. As such, I say grab it if you have the means. There are no other Joclad Danva figures to worry about, so you may as well pick up this one. 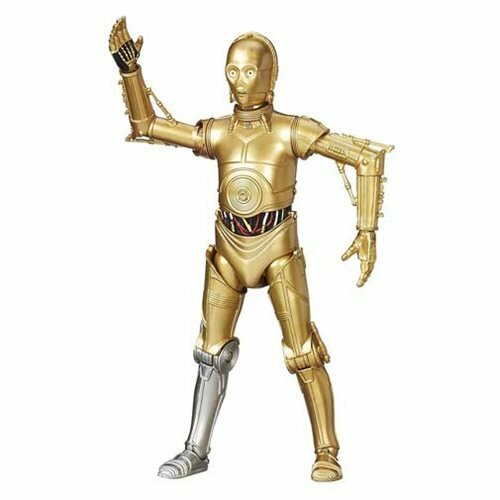 Commentary: Of all the droid figures, it seems Hasbro has the strongest affinity for droids like IG-86 (and his ancestor/descendants) as of late. This is the very first figure to use this mold, three have so far, and it looks like the designers went to town here. The legs have a ton of articulation including lateral hips, the hands can open and close, plus there's a nice level of grit. The dirt can be a pro or a con, given it didn't look too filthy in the show and a later release with more subdued damage looked more cartoony-- this one is almost realistic. (Not that this is a terrible thing, of course.) Few figures showcase this range of movement, and I would suggest buying some form of this figure just to get a good look at what Hasbro seems to be capable of doing these days. It doesn't hurt that it's a cool design. Commentary: Hasbro has understood the importance of getting the most out of a mold for quite some time now-- look at Transformers, for years nearly every mold got at least one repaint. Applying this to Star Wars, there are precious few figures you can just slap a new coat of paint on and get some other new figure from it. Thankfully George Lucas pitched in and added characters like Holographic Ki-Adi-Mundi to the movies so Hasbro could get one more squeeze out of the mold, without paint to boot. 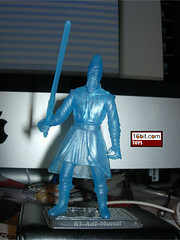 Hasbro took the 1999 Ki-Adi-Mundi, gave him a newer lightsaber mold, and cast the whole thing in clear blue. He can't sit, and he doesn't have the definition or slight coloring like he does in the movie either. So really, this is a figure that personifies (plasticifies?) the very idea of a cheap repaint. Really all he can do is stand around since he has six points of articulation and his lower robes block most leg movement. I guess this could also serve as some sort of ice sculpture, too. As line filler it's more interesting than, say, a straight reissue. 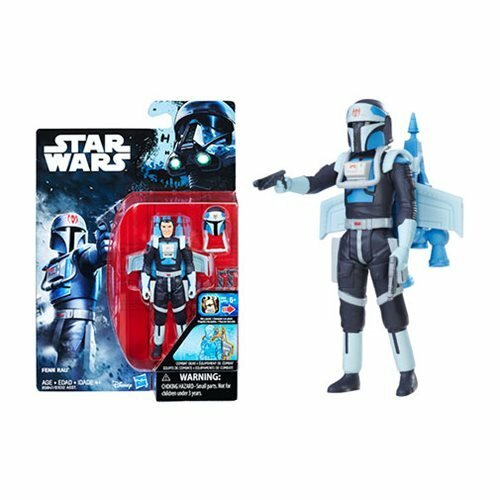 Still, a reissue might have sold better, given that the audience for a normal figure is slightly larger than that for a frozen blue Jedi-sicle. Collector's Notes: Some holographic figures enjoyed brief success as collectibles. Most go on eBay and can be bought for a song. Care to wager a guess on this one? I actually segregated the holographic figures in a separate container so they're not mixed in with the painted ones for some reason. It just seems like they should be kept away from the real ones. Image: Adam's ARC-170 on the floor. Collector's Notes: For whatever reason, this figure came and went in a hurry and as such is woefully gone from the market. It's not yet commanding premium prices, but who knows what will happen after the kids get the DVDs for the holidays. The director of the series colored him to match a favorite sporting team. Image: Adam's Geonosis Arena playset. 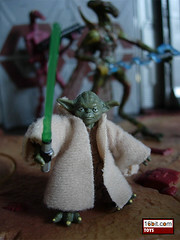 Collector's Notes: Due to Yoda's not being too great and the Destroyer Droid being arguably inferior to the 2007 release, this is one set you could probably skip unless you're a fiend for Yoda variations. 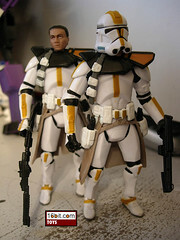 Commentary: The Clone Trooper (Coruscant Guard) shows how to do a Clone repaint right, and cheap. 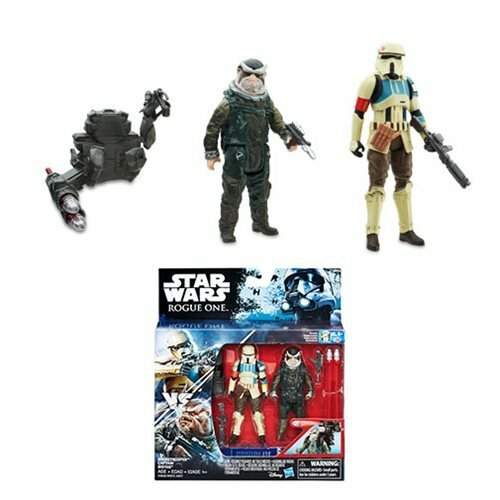 Of course, the days of 5-figure Battle Packs are now over, but this one included 4 of a new Clone plus a Yoda figure for a mere $22, which, today, sounds like some sort of beautiful dream. This figure was designed to be part of Fox' crew from the end of The Clone Wars movie and, not surprisingly, uses the same Clone body we're all used to, before the helmet revision. It is what it is-- pretty cool, pretty red, and a squad in a box. Collector's Notes: If you missed this set, you're probably sorry. It was a nice set, and so far this particular clone was only available in this exact set. Thankfully, as of today, its eBay price is still pretty reasonable-- roughly retail, which is still a bargain for what you get. Commentary: As fans tend to like Sith Lords, it's a wonder Hasbro hasn't gone crazier with figures from the Legacy comic series. (Which, I should add, has no real relation to the action figure line called The Legacy Collection.) The big bad wolf of the series is Darth Krayt, first introduced as a mighty armored villain and later revealed to be A'sharad Hett. (The spoiler window is a year, tops.) Fans have been asking for a figure of the character for a while, and now that we have one it's a really mixed bag. For example, he has a removable mask and can store his twin lightsabers on his back-- that's pretty cool. Unfortunately, the helmet is tough to get off, his left hand was not designed to hold a lightsaber (for a character that wields two, this is a flaw), and his tattoos don't quite match up with those of his younger self. Maybe he grew some new skin? The figure has a lot of detail but is lacking in painted highlights. The entire body is basically a silvery grey, while, while OK, seems off model because in the comics he's depicted wearing this strange, living armor. (You see, his armor is borrowed from the Yuuzhan Vong species, where everything is biotech and can sneeze and stuff.) As such, this looks more like some space samurai than an alien life form suit. The sculpt qualifies as good enough, except for the hand, and overall Hasbro crafted a pretty good figure. Sure, he can't sit, but does that surprise anyone these days? All the ridges and nubs on the armor and skin are nicely done, and if you leave the helmet (and the hand rubber bands) on, the figure will probably serve you well. Mine had the shoulder armor fly off as soon as I opened it, so as a toy figure, this isn't a real high mark. So in other words, it falls short on being a toy and on being a nice collectible figure, so if you get one and leave it in the package you might be the best served here. 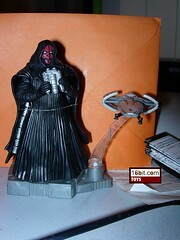 Collector's Notes: So far this figure and all the red-carded Comic Packs have been somewhat tough to get. With only two waves released in 2009 and the Fall 2009 waves not showing up for pre-sale anywhere yet, it should come as no surprise that Hasbro is planning to eliminate this assortment in the coming year. Commentary: Few aliens have been on fan wish lists for as long as Hermi Odle, as the big, ugly Jabba's Palace aliens were not only recognizable, but pretty amazing. He's unusually big, requiring a specially sized blister on his package, plus he's fairly well detailed. It seems that he's not quite as amazingly decorated as Ephant Mon, but Hermi here does have an articulated mouth, cloth garments, ball-jointed shoulders and ankles, it's actually pretty swell given that odds are Hasbro could have just made it a statue and fans would have been happy with that. There's good paint on the wrinkles, the lazy eye looks fantastic, the tongue hanging out is a wonderful detail, really I could go on all day here. The quality is here, the character has never been done as an action figure before (or since), this is really one of those figures you positively must own. Collector's Notes: This figure didn't stick around for too long, appearing with the Expanded Universe wave rather than with the Return of the Jedi in 2007. Odd, but hey, at least we got one now. 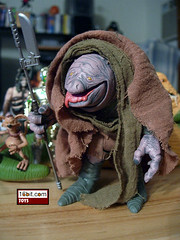 If you like Jabba's Palace, this is one of those figure you really owe it to yourself to own. It's still generally pretty cheap, so get it sooner rather than later. Image: In a toy room. Commentary: One of the first members of Joker Squad introduced-- and one of few survivors-- was Anson Trask, a fresh-off-the-space-boat young man with a goofy haircut. Since the comic depiction of Legacy-era Stormtrooper armor varies from issue to issue, as seems to be the style 150 years after Palpatine died. 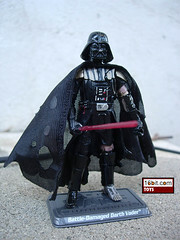 The figure is based on the Vintage Original Trilogy Collection sculpt with the revised neck post. So yeah, if you have one of the Clone-headed troopers or Luke or Han Stormtroopers, this is basically that with a new head and a white blaster holster. Basically, it's another Stormtrooper for your ranks, which is as good a reason to buy this as any. The head sculpt and hairdo match the comics nicely, but he's seemingly lacking in neck. Collector's Notes: This figure comes with 5 others in the Joker Squad set, which is currently exclusive to Entertainment Earth. The story of the squad appears in Legacy #4 or the second volume of the collected graphic novel.